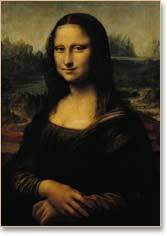 Paris Art Gallery: History, Collection, Paintings, Sculpture: Mona Lisa, Venus de Milo. The Louvre: Pyramid in Foreground. One of the world's best art museums. Housing one of the most famous collections of fine art, including the priceless Greek statue the Venus de Milo and the portrait of the Mona Lisa by Leonardo Da Vinci, the Louvre Museum (Musée du Louvre) is France's national museum and art gallery. One of the best art museums in Europe, its collection encompasses eight departments - Middle Eastern Antiquities; Egyptian treasures; Greek, Etruscan, and Roman Antiquities; Islamic Art; Paintings, and Prints and Drawings; Sculpture and Decorative Art - and includes the finest assortment of French painting from the 15th to the 19th century, together with hundreds of masterpieces of Renaissance art, as well as oils by Flemish and Dutch Realist masters of the Baroque period. Visitors to the Louvre now number 9 million, making it the most popular art museum in the world. It ranks with the British Museum as one of the world's greatest collections of antiquities. most valuable fine art painting. Situated on the Right Bank of the River Seine in Paris, the museum is housed in the Louvre Palace (Palais du Louvre) on the site of a fortress built by Philip Augustus in the 12th century. In 1546, the wily Francis I, himself an avid art collector, demolished the fortress and built the Louvre Palace (part of which still survives), which was added to by almost all his descendants. In 1682, the palace was vacated by Louis XIV, who moved the French Royal Court to Versailles, and in the following century it was converted into a museum. It opened to the public as the Musée Centrale des Arts in 1793, during the French Revolution. The collection iself, acquired over the centuries by French Kings and Cardinals included a range of treasures from abroad including part of the art collection of the English Catholic monarch Charles I. It was further enlarged during the 19th century by Napoleon I, Louis XVIII and Charles X, through purchases, donations and colonial acquisitions. In 1989, as part of a series of renovations to the museum, the architect IM Pei designed a new entrance in the central courtyard which incorporated the famous glass Louvre Pyramid - now an independent architectural highlight of the complex. The Louvre's eight separate collections contain a staggering 380,000 items, dated from 6,000 BCE to the 20th century. Of these, some 35,000 works of art are actually displayed throughout the gallery complex. Here is a brief outline of the exhibits. Art Evaluation: How to Appreciate Art. Begun in 1881, this department showcases ancient Middle Eastern civilization before the coming of Islam. Exhibits of Mesopotamian Art include earthenware, ceramics, Mesopotamian sculpture and numerous other works of Sumerian art (c.4500-2270 BCE), Assyrian art (c.1500-612 BCE) and Hittite art (c.1600-1180 BCE), as well as Ancient Persian cultures, including celebrated artifacts such as The Code of Hammurabi, and the Persian Archers of Darius I. One of the world's largest collections of artworks and artifacts from ancient Egypt, this department contains more than 50,000 items from the Middle Kingdom, the New Kingdom, and the Roman, Ptolemaic, and Byzantine periods, dating back to 4,000 BCE. Important elements include the the Drovetti, Durand and Salt collections, as well as a large number of exhibits excavated from Memphis. Exhibits include: Fayum Mummy portraits and other paintings, sculpture (including gold items), papyrus scrolls, mummies, tools, clothing, jewellery, games, musical instruments, and weapons. One of the original parts of the Louvre's treasury, this department contains an outstanding collection of statuary, jewellery and ceramics from the Minoan, Mycenean, Daedalic, Archaic, Classical and Hellenistic eras of ancient Greece, as well as ancient pottery, reliefs, portrait busts and free-standing sculpture from the early Etruscan, Republican and Imperial eras of ancient Rome. Important examples of Greek art include the marble statues Venus de Milo (150-100 BCE), Nike of Samothrace (c.190 BCE) and The Winged Victory of Samothrace (190 BCE). Roman art is represented by the portraits of Agrippa and Annius Verus. The Louvre's exhibition of Islamic art includes metalwork, wood and ivory carving, ceramics, glass, carpet, textiles, calligraphy, rare manuscripts and miniature painting from the 7th to the 19th century: a total of over 5,000 works. The Louvre's magnificent collection of sculpture features all marble & bronze statuary, reliefs, busts and other sculptures outside of classical antiquity up to 1850. (Post-1850 works are now in the Musee d'Orsay.) Highlights include Dying Slave (1505-16) by Michelangelo and Psyche Revived by Cupid's Kiss (1787) by Antonio Canova. This department consists of artworks on paper, divided into three sections. The core Cabinet du Roi, 13,000 royal copper printing-plates, and the gifted collections of Edmond de Rothschild, featuring 40,000 prints, 3,000 drawings, and 5,000 illustrated books. Highlights include: Self-Portrait at 22 (1493) by Albrecht Dürer. Proto-Renaissance: The Madonna and Christ Child Enthroned with Angels (1270) by Cimabue; Saint Francis of Assisi Receives the Stigmata (1290-1300) by Giotto. Early and High Renaissance: St. Sebastian (1480) by Andrea Mantegna; The Virgin of the Rocks (1483), The Mona Lisa (1503-6), and Virgin and Child with St. Anne (1501-12) by Leonardo Da Vinci; and Portrait of Baldassare Castiglione (1514) and La Belle Jardinière (1508) by Raphael. Mannerism: The Wedding Feast at Cana (1562) by Paolo Veronese; Supper at Emmaus (1601) by Caravaggio. Baroque: Coronation of Marie de' Medici in St. Denis (1622-5) and The Landing at Marseilles (1623-5) by Peter Paul Rubens; The Club Foot (1642) by Joseph de Ribera; Le Jeune Mendiant (1650) by Bartolomé Murillo; Bathsheba at Her Bath (1654) by Rembrandt van Rijn; both The Lacemaker (1669) and The Astronomer by the Dutch Realist painter Jan Vermeer; Cycle of the Four Seasons (1660-4) by the academic classicist Nicolas Poussin. 18th Century: The Pilgrimage to Cythera (1717) by the Rococo painter Jean-Antoine Watteau; La Raie (1727) by the master of still life Jean Chardin; The Coronation of Napoleon, and The Oath of the Horatii (1784) by the Neoclassicist Jacques-Louis David. 19th Century: The Valpincon Bather (1808), La Grand Odalisque (1914) and Portrait of Monsieur Bertin (1832) by the great academic artist J.A.D. Ingres; The Raft of the Medusa (1819) by the 19th century Realist Theodore Gericault; The Death of Sardanapalus (1827) and Liberty Leading the People (1830) by the Romantic artist Eugene Delacroix (1830); Bridge at Narni (1826) by the plein air landscape painter Jean-Baptiste Camille Corot. See also our article: How To Appreciate Paintings. The Louvre's Decorative Art department encompasses a diverse range of master craftsmanship dating from 1100 to 1850. Important exhibits include: the 12th century Porphyry vase, Louis XIV's coronation crown, Charles V's sceptre, and Madame de Pompadour's Sèvres vase collection. Other displays include the Campana collection of gold jewellery, and the Durand collection of ceramics, enamels, and stained glass. The French authorities have decided to establish two satellite galleries as part of the Louvre complex. The first, to be known as Le Louvre-Lens, will be built in the northern French town of Lens. The second more ambitious project involves the construction of a 24,000 square metre premises in central Abu Dhabi. The Louvre will provide up to 300 works of art, while additional items will be loaned by other Parisian galleries like the Georges Pompidou Centre of Modern Art, the Musee d'Orsay, and the Musee Rodin. For another key cultural attraction in the city of Paris, please see the Eiffel Tower (1887-89), designed by Gustave Eiffel (1832-1923).  For details of the development of painting and sculpture, see: History of Art.  For more information about the world's greatest art museums, see: Visual Arts Encyclopedia.